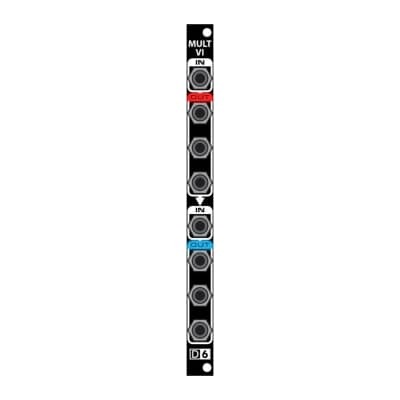 Plug a signal into input 1 and it will be available from all 6 outputs. 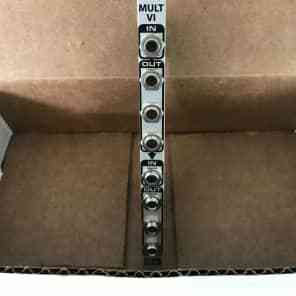 Add a different signal into input 2 and it breaks the chain; signal 1 comes out 3 outputs and signal 2 is available at the remaining 3. * With nothing plugged into the power connector or cascade jacks the module depth is at least 35mm. * With a power cable that doesn't have a strain relief you can stay under 35mm. * A power cable that has a strain relief will require a depth just under 40mm. * Using the cascade jacks with right angle cables, a case depth of at least 50mm will be needed. * Using the cascade jacks with standard straight cables, a case depth of at least 60mm will be needed.